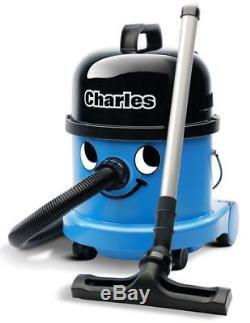 Numatic Charles CVC370 2 Vacuum Cleaner Hoover Wet & Dry 3 in 1 Blue A21A Kit UK. 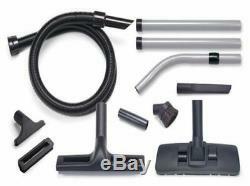 The Numatic'Charles' CVC370-2 Wet & Dry Vacuum Cleaner & A21A Accessory Kit. You want a vacuum cleaner that is totally without compromise, be it for wet or dry use, and that's exactly what you get. One minute (or most of the year in the majority of cases) Charles will be up to his neck in dust and dirt, keeping everything spick and span, and then suddenly the call arrives and he's expected to unblock the sink or dry the floor. Well, it's no problem with Charles, he has our full Twinflo' motor and performance to give you exactly what you need. Big filters and Hepaflo dust bags for dry use and a safety float valve for wet pick-up. Tubes are lightweight aluminium and will never rust. Two floor nozzles, one for wet work and a superb combination nozzle for carpets and hard floors, and even that has a stainless steel high efficiency carpet plate. Add to this three smaller tools and you are ready to tackle almost anything that comes along, be it floors or floods, corners or curtains, you are in control. Eco Friendly High Efficiency Twinflo 1060w Motor 2016 Model. Compact whilst offering professional 15 litre capacity dry, 9 litre capacity wet. Easy reach, 10 metre cable and rewind storage system. A tool for every job, full accessory kit A21A with painted aluminium tube set. High 49 litre per second airflow. Numatic Hepaflow Easy Change NVM-2BH Bags are used (4 supplied with each machine). Dimensions: 355mm x 355mm x 510mm. Supply Voltage: 220-240v AC 50/60Hz. The Full Numatic A21A 32mm Wet & Dry Accessory Kit 607221 includes. 1 Numatic Aluminium Tube Bend with Volume Control 601025. 2 Numatic Aluminium Extension Tubes 601024. 1 Numatic 240mm Crevice Tool 601142. 1 Numatic Nuflex 2.4m Threaded Hose 601101. 1 Numatic Double Taper Hose Tool Adaptor 601141. 1 Numatic 65mm Soft Dusting Brush 601144. 1 Numatic 150mm Upholstery Nozzle 601145. 1 Numatic 150mm Slide on Brush for Upholstery Nozzle 601146. 1 Numatic 300mm Combination Floor Nozzle 902070. Our reputation is built on customer care and we are constantly striving to improve this aspect of our business. Our staff are fully trained to answer any questions or assist with any orders. Fast Light Limited, 2 Bessemer Park, Bessemer Road, Cranbourne Lane, Basingstoke, Hampshire, RG21 3NB. Company Registration Number: 03931735 VAT Number: 733653334. All prices shown are inclusive of VAT at the current rate. VAT invoices are supplied and enclosed with each order. If orders are received by 3.00 P. We have a very high next day success rate with our current carrier but occasionally things go wrong, please bear with us on this, as soon as we know something is not right with regard to your order we will contact you as soon as we know. The Highlands and Islands of Scotland - postcodes IV, HS, KA27-28, KW, PA20-49, PA60-78, PH17-26, PH30-44, PH49-50, ZE. Northern Ireland, Isle Of Man, and Isles of Scilly - postcodes BT, IM, TR21-25. Isle of Wight - PO30-41. Please note that we classify the Channel Islands as an international destination. The item "Numatic Charles CVC370 2 Vacuum Cleaner Hoover Wet & Dry 3 in 1 Blue A21A Kit UK" is in sale since Wednesday, June 29, 2016. This item is in the category "Home, Furniture & DIY\Appliances\Ironing & Vacuuming\Vacuum Cleaners".